My name is Jim Goughary, and I raced a Piper-Honda Formula F in the 2011 U.S. F1600 Championship. I’ve raced a bunch of stuff – most recently in the SCCA Pro Racing Trans-Am Series. But most of my career has been in ‘spec’ cars, both of the sports racer and open-wheel variety. 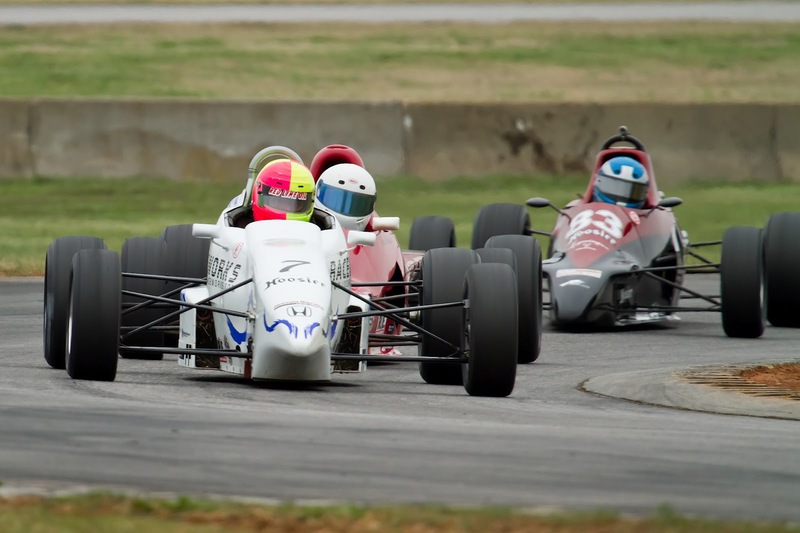 The F1600 Championship is anything but ‘spec,’ featuring a variety of chassis and, with the introduction of the Honda Fit engine to the Formula F class – both at the amateur and professional levels – a choice of power plants, too. Years ago, when I was racing a ‘spec’ formula car, I got involved with a company called Raceworks out of Gainesville, Ga. While I had previously owned my own car, doing a deal with Raceworks made more financial sense. I ended up winning two SCCA Club Racing National Championships with them. After that, I competed in GT-1 and Trans-Am. Then I found myself with nothing to do for 2011. I got a call out of the blue from Raceworks. They had just ordered a brand-new Piper chassis with a Honda engine for Formula F. They wanted to know if I wanted to race it. I said, ‘Yeah, let’s go.’ It turned out pretty well for us, with a victory in the opening race at Virginia International Raceway and a third-place finish in the championship. Going in, we expected that it was going to be an uphill battle, because we’d heard that the air restrictor that SCCA had chosen for the new engine was a little on the small side. But we also knew that, the more people that raced the Honda, the quicker we could get SCCA to equalize the class and give the car the right restrictor. We took the car to an early-season double National at Sebring International Raceway. The car hadn’t even seen the track yet. We poured a seat for it when we got there, and we raced the next day. We did OK, but we were well off the track record. I feel like we got up to speed relatively quickly, but we clearly had a tough battle ahead of us. When the new class for the pro series was announced – sanctioned by SCCA, but using different rules – it offered a clear avenue for us, because the SCCA committed to equalizing the engines pretty quickly. It’s pretty close now. We’re able to run up front and with most of the Ford engines, only losing ground to the very best. While the class isn’t the ‘spec’ variety that I’m used to, there is a similarity. In ‘spec’ classes, you take the engine out of the equation. That’s actually almost the case with the Honda Fit engine in Formula F, because there’s virtually nothing you do with the motor other than start and drive it. There’s nothing that goes wrong with it. For the guys that we’ve talked to that have a lot of time on it …Mike Scanlan, for instance, has well over 4,000 race miles on his engine … it’s never missed a beat. The fuel injection is nice because there’s no worrying about the air density or tuning the carburetor. It allows you to focus on driving. I enjoyed racing the F1600 Championship. It’s extremely well-organized and the guys in charge make really good, common-sense decisions at the track. These guys are at the top of their game and they’ve got good venues. I also love it from a sheer driving standpoint. It’s hard not to run at ten-tenths the whole time if you want to be up front. One of the things I really enjoyed about the series is the support from Honda. Tom Grosart from Honda Performance Development was at every single race to help diagnose any problems that came up. He was a big help throughout the season. And at Mid-Ohio – which might be considered Honda’s home track in the U.S. because of their several Ohio manufacturing facilities, including the plant in Marysville – American Honda brought its IndyCar Series catering bus and served lunch to every competitor in the paddock throughout the weekend. That was a nice touch. There’s also the contingency money available, which can really help. For 2012, I’m working with a new team, BlackWatch Racing Group, driving a Honda-powered Van Diemen. We contested the first SCCA National race of the year at Sebring and fared well, now that SCCA has given the Honda engine a larger restrictor. Our chances look really good for the F1600 Championship and SCCA National Racing.